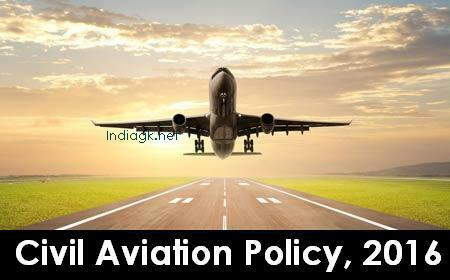 Civil Aviation Policy 2016: Union Cabinet chaired by the Prime Minister Shri Narendra Modi has given its approval for the New Civil Aviation Policy on 15th June 2016. This is the first time since Independence that an integrated Civil Aviation Policy has been brought out by the Ministry of Civil Aviation. The Viability Gap Funding (VGF) will be funded by a small levy per departure on all domestic routes other than Cat II/ Cat IIA routes, RCS routes and small aircraft at a rate as decided by the Ministry from time to time. The 5/20 rule for commencement of international flight in operation since 2004 is replaced by a formulation which provides a level playing field and allows airlines, both new and old, to commence international operations provided they continue to meet some obligation for domestic operation. The Route Dispersal Guidelines (RDG) have been rationalised by making the criteria for declaring a route as Category I (trunk route) more transparent, while the traffic to be deployed on Cat II and IIA expressed in terms of a percentage of CAT I traffic remains the same. The regime of bilateral rights and code share agreements will be liberalised leading to greater ease of doing business and wider choice to passengers. “Open skies” will be implemented on a reciprocal basis for SAARC countries and countries beyond 5000 kms from Delhi. Upgradation and modernisation of Air Navigation Services will continue in line with global trends. AAI will provide a fully harmonised Air Navigation System considering International Civil Aviation Organisation (ICAO) Global Air Navigation Plan, Aviation system Block Upgrade and modern performance based technologies and procedures. The existing ground handling policy is being replaced with a new framework to ensure fair competition. The airport operator will ensure that there will be three Ground Handling Agencies (GHA) including Air India's subsidiary/JV at all major airports as defined in AERA Act 2008. At non-major airports, the airport operator to decide on the number of ground handling agencies, based on the traffic output, airside and terminal building capacity. All domestic scheduled airline operators including helicopter operators will be free to carry out self-handling at all airports. Hiring of employees through manpower supplier will not be permitted.